The emancipation of the Jews of England was largely complete when George III came to the throne in 1760. Free to live how and where they wished, the Jews had been specifically exempted from the provisions of the 1753 Marriage Act which made Christian marriage the only legal option for all others. The effect of this exemption was to put the matrimonial causes of the Jews of England exclusively in the hands of their Rabbis and Dayanim (Jewish ecclesiastical judges) for the next one hundred years. No Bet Din (Jewish ecclesiastical court) anywhere in the world has left such a complete record of its transactions -- matrimonial and proselytical -- as that contained in the extant Pinkas (minute-book) of the London Bet Din from 1805 to 1855. In all other matters, including the offences punishable by transportation, Jews were subject to the jurisdiction of the civil courts. Of the estimated 150,000 convict transportees shipped to the Australian penal colonies, some seven hundred were Jews. Matrimonial and related matters involving twenty of these miscreants are recorded in the Pinkas. 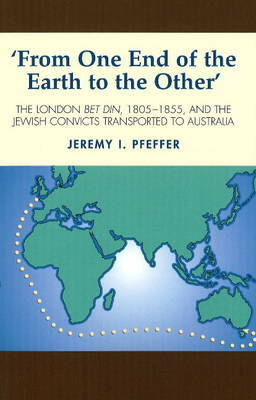 Jeremy Pfeffer recounts the history of the London Bet Din during these years as revealed by the Pinkas record and relates the previously untold stories of this group of Jewish convict transportees and their families.